The royal wedding website will be the first place to view "details of Miss Middleton's dress" and other information. London (CNN) -- The official website for the wedding of Britain's Prince William to Kate Middleton launched Wednesday, the royal family announced. William, who is second in line to the throne, is marrying Middleton on April 29 at Westminster Abbey. 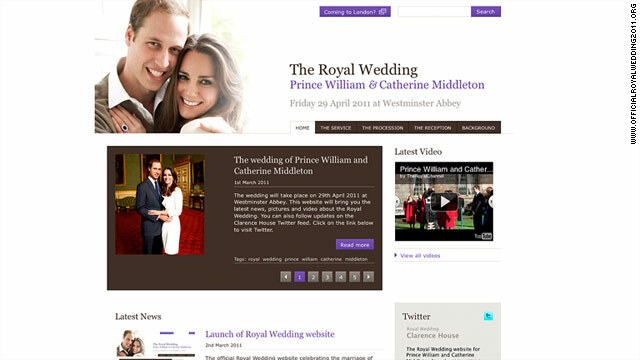 The website, www.officialroyalwedding2011.org, will have exclusive content including photos, features, videos and links, William's office said in a statement. The website "will be the first place to view information such as the details of Miss Middleton's wedding dress," the palace promised. It may feature a live stream of the wedding, "subject to further planning work," the statement said. The British monarchy is already active online, with YouTube, Facebook, Flickr and Twitter accounts. The website is hosted by Google App Engine and was built by Accenture, the palace said. Design and creative advice was offered by Reading Room.